Mobile application development cost may vary significantly depending on different factors. Most of them are listed below. The cost of a mobile application highly depends on its type. While native apps are developed to work with one particular platform (iOS, Android, Windows phone, etc. ), hybrid and cross-platform are created for all platforms altogether. Usually, the price depends on the number of platforms and devices that needs to be supported. 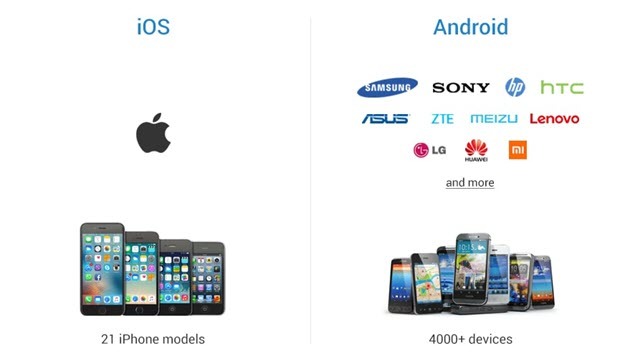 As a rule, the development for iOS is less expensive than for Android. It’s because the number of iOS devices is much less than a vast variety of Android devices. Although the main factor to consider is the client’s preferences, it is also important to determine devices/OS versions present on a particular market and define the market share for each Android device manufacturer and OS version. Still, quite often customers decide on supporting only the most popular Android devices and in such case, they can limit Android app development cost. But if a customer chooses to support some more devices, the price exceeds exponentially. Choosing additional models means more time spent on adapting the application for various screen sizes, resolutions, hardware specifications, and testing. The technical complexity of an application should be taken into account while estimating it’s development cost. The more difficult is the functionality, the more time required to implement it and the more professionals are to be involved in the development process. One of the most important things to remember while planning app development budget is the application’s after-release support. Usually, it is not included into the initial estimate but makes a huge impact on the product’s success. Such a descriptive app development cost approach can be helpful in estimating the approximate price of the desired application. However, the exact price of an application might vary from company to company. Keeping in mind the factors that influence the cost deepens the understanding of the development process, helps to decide on the app’s type and functionality and choose the most suitable mobile application development company.